Mainstreet: All his life, Mark Warren has been drawn to the forest. Now, he shares his love of the outdoors at a summer camp in the untrampled woods of Lumpkin County. He is a voice in the wilderness and for the wilderness. Mark Warren teaches people how to survive in the woods, play in the woods, use the gifts of the woods and respect the spiritual connection between the land and their lives. 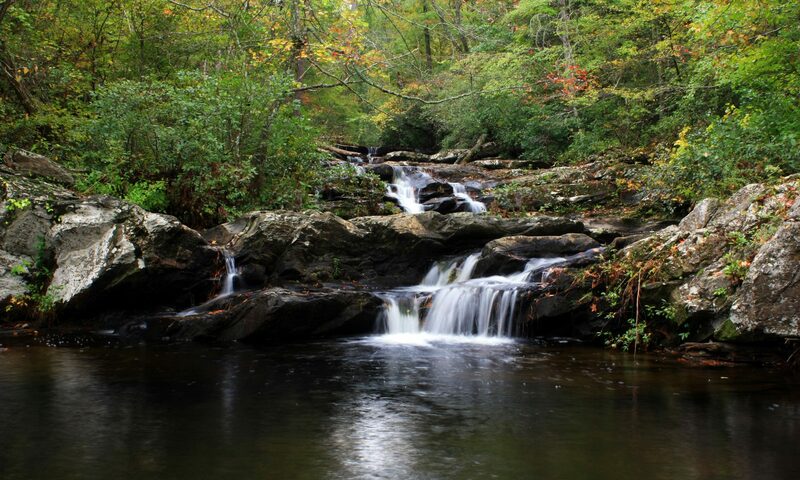 His outdoor school, called Medicine Bow, is a tract of undisturbed forests and clear streams in rural Lumpkin County, not far from Dahlonega. Warren, a former naturalist for the Georgia Conservancy and a wilderness director for a based youth camp, has had a lifelong attraction to the study of nature. “I look into the heart of the forest and see an endless adventure,” Warren said. Schoolchildren and adults come to Medicine Bow to learn things like tracking, archery, primitive camping, forest botany and Native American lore. But this isn’t a typical summer camp. Warren can take them to the floor of the forest to show them which plants make a good snack and which can settle an upset stomach. He can show them how to find a tree whose wood is suitable for making a longbow, and then show them how to make it. Often, as their workshops end, he takes his students to a totem pole in the meadow he uses for an archery field. Using their favorite animal and what they see as their most distinctive personality traits, Warren will lead a naming ceremony, giving the students Native American- style names and adding a depiction of those names to the totem. As a boy, Warren was drawn to the woods; as a man, he’s never left. After college, he used the opportunities his jobs offered to study with botanists, or simply to take nature studies books into the woods with him and learn that way. But he wanted to make some deeper connections, and he knew this would best be done alone. With only a few exceptions, Warren is the only teacher at Medicine Bow. “I didn’t want to do the traditional camp things like swimming and horseback riding,” he said. Instead, he wanted to teach a philosophy of living with nature and respect for nature. To do that, he needed to learn the way the Indians had done for centuries before the white man arrived. “I knew if I wanted to learn about nature, I had to study Native Americans,” he said. More than living off the land, Native Americans learned how to live in harmony with the land, he said. “In the old times, every Native American knew where everything came from; therefore, they treated everything on the land with respect,” he said. If a Native American were going to harvest a plant or shrub growing wild in the forest, he might circle it first, offering a prayer of tribute or thanks, Warren said. And it would never enter a Native American’s mind to do anything that would foul a stream that provided drinking water for others, he said. “What most people now call weeds were staples of life for the Native American,” he said. For example, the dandelion plant that many modern homeowners wage chemical warfare against was an important source of food and medicine. Indian lore can go only so far in teaching the secrets of the wilderness, however. Warren said much of the traditional Native American knowledge has been lost over time, so he and other naturalists must use modern scientific techniques to regain that knowledge. are hesitant to step into a mountain stream because they are more comfortable with secondhand experiences such as video games. Even so, he said, children are also hungry for the concepts taught at Medicine Bow. “They’re so open to the miracles around them,” Warren said. And as his students leave, he compares them to arrows shot back into the world from the Medicine Bow of Native American legend. That bow was never used to pierce the flesh of a man or an animal, but only for the good of the people. “The last thing I tell them is, ‘Teach somebody something you learned here,’ ” he said.